Development for the DROIDX is still going strong and Ice Cream Sandwich has unofficially made its way to the handset thanks to the underground Android developer community. A dev by the name of firstEncounter over at RootzWiki got a little tired of not seeing enough ICS for his device and decided to go ahead and start making one that worked properly. He must have done pretty well because we have been getting lots of emails regarding his work. From the looks of the forum post, his ROM almost has all the fully working features one would hope for in a daily driver. 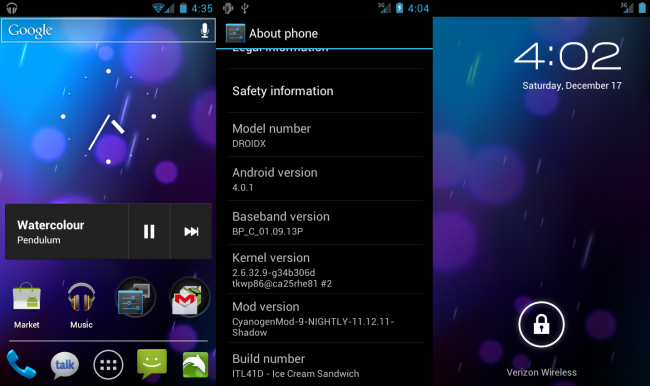 The ROM is based on CyanogenMod 9 and has working radio/data, SMS, WiFi, hardware buttons, and so much more. But as always, there are a few things that are not working as well such as the camera, MMS, and voice input. Development is continuous so we are sure to see some of those kinks worked out soon. If you want to give ICS on your DX a go, then follow the via link down below and make sure to read the instructions and create a backup. Good luck and have fun!